The Hidersine 5049C Carbon Fibre Violin Bow is a half size violin bow that is a superb introduction to carbon fibre bows. Lightweight and easy to play the 5049C features traditional winding and a half mounted frog. 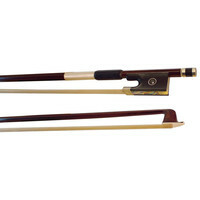 The Hidersine 5049B Carbon Fibre Violin Bow is a 3/4 size violin bow that is a superb introduction to carbon fibre bows. Lightweight and easy to play the 5049B features traditional winding and a half mounted frog. The Hidersine 5051 Carbon Fibre Viola Bow is a full size viola bow that is a great replacement or advancing student bow at an affordable price. The 5051 bow comes with a silverplated copper wire grip and a fully mounted ebony frog. The Hidersine 5063 Octagonal Brazilwood Viola Bow is a full size viola bow that is a great replacement or advancing student bow at an affordable price. The 5063 bow comes with a silverplated copper wire grip and a fully mounted ebony frog. The Hidersine 5049A Carbon Fibre Violin Bow is a full size violin bow that is a superb introduction to carbon fibre bows. Lightweight and easy to play the 5049A features traditional winding and a half mounted frog. The Hidersine 5066 Pernambuco Viola Bow is a full size viola bow that is a great replacement or advancing student bow at an affordable price. The 5066 bow comes with a silverplated copper wire grip and a fully mounted ebony frog. The Hidersine 5052A Carbon Fibre Cello Bow is a full size cello bow that is a superb introduction to carbon fibre bows. The 5052A bow comes with a silverplated copper wire grip and a fully mounted ebony frog. 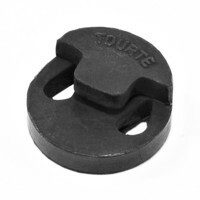 Tourte Violin Mute – uses state-of the-art dampening rubber to mute the sound of the violin. Remains on strings behind bridge when not in use. Hidersine Double Bass Rosin. Medium. Temperate. The Hidersine 5064A Brazilwood Cello Bow is a full size cello bow that is a great replacement or advancing student bow at an affordable price. The 5064A bow comes with a silverplated copper wire grip and a fully mounted ebony frog. The Hidersine 5067A Octagonal Pernambuco Cello Bow is a full size cello bow that is a great replacement or advancing student bow at an affordable price. The 5067A bow comes with a silverplated copper wire grip and a fully mounted ebony frog. The Hidersine 5065A Octagonal Pernambuco Violin Bow is a full size violin bow that is a great replacement or advancing student bow at an affordable price. The octagonal bow comes with a silverplated copper wire grip and a nickel mounted ebony frog.This item is an ex showroom display model. There are light scuffs and signs of use around the casing. The original boxing and manual are not included.Otherwise the unit operates as new. This is a great opportunity to buy a fully functioning product at a discounted price supplied with a one year warranty. The Hidersine 5062B Octagonal Brazilwood Violin Bow is a 3/4 size violin bow that is a great replacement or advancing student bow at an affordable price. The octagonal bow comes with a silverplated copper wire grip and a nickel mounted ebony frog. The Hidersine 5062A Octagonal Brazilwood Violin Bow is a full size violin bow that is a great replacement or advancing student bow at an affordable price. The octagonal bow comes with a silverplated copper wire grip and a nickel mounted ebony frog.